I like it. Obviously, a play on "my child was student of the month at such and such school." So, the question was - for me at least - what is a mensch? 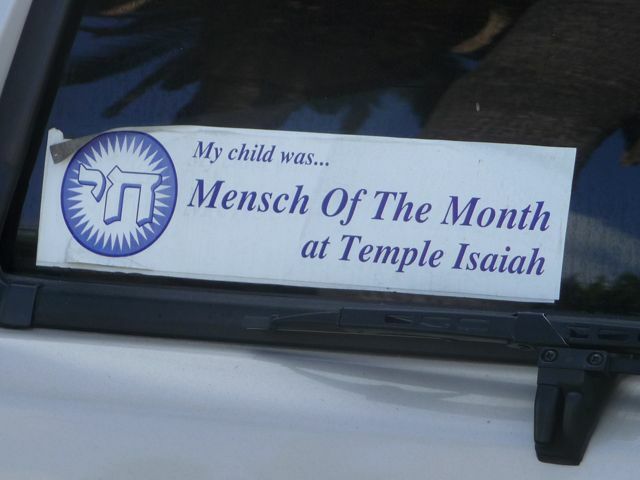 A mensch is a "a person of integrity and honor," and "someone to admire and emulate, someone of noble character." It's a Yiddish word - מענטש - meaning "a human being" literally a "son of Adam." On his blog http://blog.guykawasaki.com/2006/02/how_to_be_a_men.html entrepreneur, author, and speaker Guy Kawasaki lists five characteristics of "How to Be A Mensch"
Help without the expectation of return. I'd recommend reading the entire post. While this is an excellent list, and a good follow up question might be why? Why be a mensch? Why bother being a good person? On the same blog post, Kawasaki implies that a mensch will have a much greater reward in heaven. I applaud his chutzpah for bringing not only morality, but an eternal perspective into a blog on business ethics. In our secular society, that's refreshing - amazing, really. As a Christian, I don't believe heaven - that is, eternal life - is something that can be earned. In that sense, perhaps just striving to be a good person can blind us to fact that we really aren't. On the other hand, while I can't speak for those of other faiths, for Christians, gratitude for God's gift of eternal life should effect every area of our lives, especially how we treat those who share different beliefs. Call it ignorance or youthful stupidity, but over the years I certainly have exhibited my share of un-mensch-like behavior - so it's much easier said than done. Mensch. It's a great word. And hopefully, for me at least, a bit less of a foreign one. I like it. (the blog). Never knew the def. of mensche before - even though I've heard the word many times. Thanks for educating me. That's funny. We in Germany hear the word "Mensch" every day. Mensch is the common German word for "human" ... I never knew that this is a Yiddish word!